What if there was a place where you could view just your builds, across all your projects? Instead of having to hunt through different projects and everyone else’s builds, you could just have one place to go to quickly see everything you’ve been working on. Introducing the new Personal Dashboard on Codeship. This will make finding your own builds a lot easier, across all your projects and organizations. As the main entry point to Codeship, your dashboard ensures that you no longer have to remember what project the build was in or when it ran — your recent builds will be the first thing you see! We realize that not every Codeship user contributes code and triggers builds. For those of you in that group, we have plans as to what to add to the the dashboard specifically for you. The personal dashboard lays a foundation for us to bring all users a more personal experience. You should see more information added later this year to help you. Since we’re changing the first thing you see when you log in to Codeship, we streamlined the UI. The first thing you’ll notice is that what was previously called Dashboard is now called Builds. Don’t worry, the view is exactly the same, and it still shows you all the builds for the selected organization. It just didn’t function like a dashboard, so calling it Builds is more fitting for what you’ll find in that view. The second thing is more behind the scenes; when you select the option to notify Only the build committer, the committer will actually be notified. Previously, it was difficult to know exactly who the committer was, unless the email we got on the build matched a user’s email. Not always the case. To get back to your personal dashboard, simply click on the Codeship logo in the top left, and you’ll be transported back in your own personal space. The final thing i want to cover here is how to get started with the personal dashboard in case you don’t see any builds in your dashboard. Before we had Dashboard, we couldn’t tell which build was yours — there isn’t necessarily a one-to-one mapping between your email and your git account, and not all git servers provide an email address with the build information. The one thing that we can rely on is the git username, which is what we’re using now to link your account to your builds. If you don’t see any builds, as in the screenshot above, we probably don’t have your git username (or names, in case you’re connected to multiple git servers). All you have to do is add your git username(s), and we’ll map any future builds committed by your username to your Codeship account. To do this, click the Get connected button or the small plus sign next to your avatar (see screenshot above). This will take you to your Connected Services page where you can either connect with OAuth or just supply a username. Not seeing all your builds? If you’re not seeing all the builds you’re expecting, especially older builds, that’s likely because we only start mapping builds from the git username connected to your Codeship account. For those of you who authenticate via OAuth, you should see builds from the last month or so. The OAuth connection provided us with a username, so we automatically mapped those about a month ago. Another reason might be that we only have some of your git usernames. In case you have multiple git accounts, head over to your Connected Services page and make sure each of the services has a username shown. What do you think about your new dashboard? Any ideas on what you want to see next? 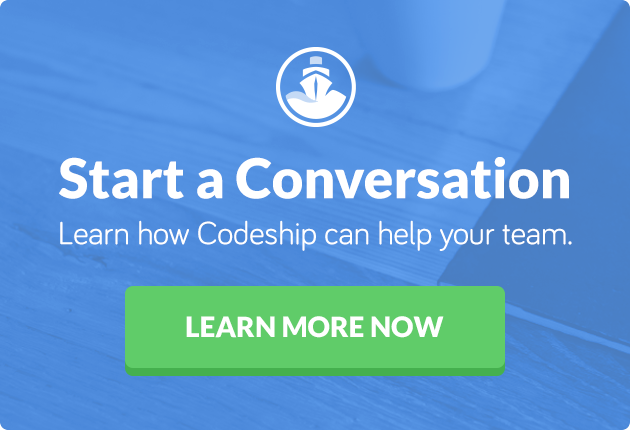 Reach out to us with your ideas and sign up for Codeship today if you’re not a user yet. We’d love to have you on board.